The 2009 Memorial Cup got underway on Friday and featured a convincing 4-1 Kelowna victory over their hosts from Rimouski. The Oceanic, well rested but obviously rusty, were never in this game as right from the opening faceoff they were out-hustled, outplayed and outscored by the Rockets. If not for the play of netminder Maxim Gougeon, the score could have easily been 5-0 after the first period alone. Kelowna struck for their first goal of the night at the 6:33 mark when Tyler Myers (BUF) fired a wrist shot from the high slot that beat Gougeon high to the blocker side. That was a popular target for Kelowna shooters who looked to expose the 5'10 netminder and it worked early on. The Oceanic were outshot 17-8 in the first period and blew a glorious extended 5-on-3 opportunity in the process. 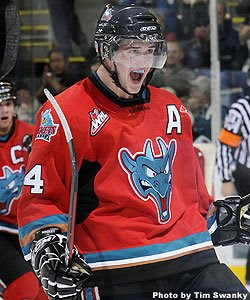 Jamie Benn (DAL), the WHL's leading playoff scorer, got on the board in the second when he was Johnny-on-the-spot standing to the side of the Rimouski goal in perfect position for the rebound of a Mikael Backlund (CGY) shot. Gougeon could do nothing on the play. The Rockets kept coming and again it was Backlund picking up an assist. The Swede broke up a neutral zone play and lifted a pass to a streaking Ian Duval who had got behind Rimouski's defence. Duval was able to knock the puck down and went in alone to put the Rockets up 3-0 just 6 minutes into the middle frame. Rimouski blew away another 5-on-3 chance by not getting a single shot on goal and the Rockets carried the 3-goal lead with them into the third period. Kelowna outshot Rimouski by a 15-4 margin in the second. 1:29 into the final period Kelowna struck again. Lucas Bloodoff potted his first of the tournament and the route appeared to be on. At times in the later stages of the game it seemed to me that the Rockets had taken their foot off the pedal, a dangerous plan in a tournament where goals for and against can come in to play. For example, Jamie Benn and Tyler Myers had a 2-on-2 where the sniper tried to force a pass across to the big blueliner instead of taking the clear shot. The Rimouski fans finally got something to cheer about when Philippe Cornet (EDM) snapped a shot that beat Mark Guggenberger and erased his shutout bid. Overall I was fairly disappointed with the Oceanic. For a team that boasts as many recognizable names as they do, they had absolutely nothing going on. Keven Veilleux (PGH) was invisible. I don't know if I even heard Peter Loubardias mention Logan MacMillan's (ANH) name. Patrice Cormier (NJ)? Jordan Caron? 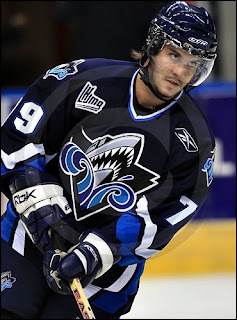 The only Rimouski forward that impressed me at all was #97, Swiss product Luca Cunti (TBY) who has terrific speed. I'll accept the argument that they were rusty but holy cow... show some life. It's not going to get any easier for Rimouski. The loss to Kelowna means they pretty much have to beat Windsor, the #2 ranked team in the country, and Drummondville, the club that swept them in 4-straight games during the QMJHL playoffs. Tyson Barrie was very impressive. I noticed him a lot more tonight than I did during the WHL final against Calgary. Sam Cosentino wondered out loud if he might still be there when Tampa Bay picks early in the second round... he might not be if he keeps playing like this but I have to admit to have been envisioning the same thing. Could Barrie end up playing for his dad's team in the Sunshine State? The Rockets are back in action on Monday when they take on Drummondville. Rimouski is off until Sunday when they will play Windsor. The next game of the tournament goes tomorrow afternoon (Saturday) at 2:30 PM Mountain time when the OHL champion Windsor Spitfires collide with the QMJHL winners from Drummondville. All games can be seen in Canada on Rogers Sportsnet and in the United States on the NHL Network.